Costello passed away in Dublin following a long illness. He is credited with developing Fine Gael’s ‘Towards a Just Society’ policy in the 1960s. THE FORMER PRESIDENT of the High Court and former Fine Gael TD Declan Costello has died in Dublin following a long illness. He was 84. He was best known for developing Fine Gael’s ‘Towards a Just Society’ policy back in the 1960s, which supported economic planning and more government intervention in the economy. It would define the party for some 20 years. 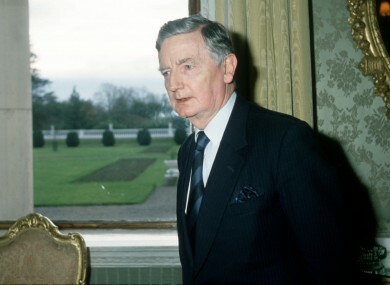 He was the son of former two-time Taoiseach John A Costello and he served as Attorney General between 1973 and 1977. Later he was appointed to the High Court and served as its president between 1994 and 1997. In 1979, he conducted an inquiry in to the Whiddy Island disaster in which which 50 people were killed when an empty oil tanker exploded in Bantry Bay in Cork. During his career as a Dail deputy, as Attorney General, and, later, as a senior member of the judiciary, Declan Costello was a public servant of huge ability, fairness and integrity. To his family, I extend my deepest sympathy on the loss of a man who served his country with great distinction. Email “Taoiseach pays tribute to former High Court president Declan Costello”. Feedback on “Taoiseach pays tribute to former High Court president Declan Costello”.